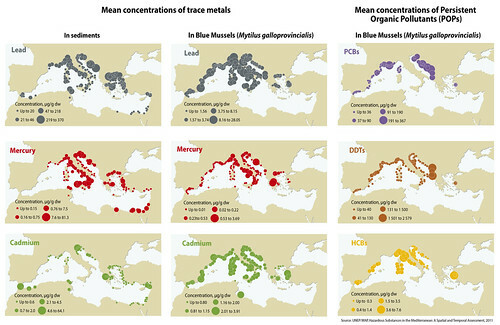 The term trace metal is used here for potentially toxic metals that persist in the environment, bioaccumulate in human and animal tissues, and biomagnify in food chains. Metals and organometallic compounds are commonly included in emission inventories and monitoring networks, specially mercury, cadmium and lead. Urban and industrial wastewaters, atmospheric deposition and run-off from metal contaminated sites constitute the major sources of toxic metals. Persistent organic pollutants (POPs) are organic compounds that are resistant to environmental degradation through chemical, biological, and photolytic processes. POPs persist in the environment, are capable of long-range transport, bioaccumulate in human and animal tissue, biomagnify in food chains, and have potentially significant impacts on human health and the environment. POPs include certain chlorinated pesticides and industrial chemicals such as polychlorinated biphenyls (PCBs), most of which have already been prohibited in Mediterranean countries. However, POPs can also be unintentionally released, mainly as a result of combustion processes or as by-products in some industrial processes. Some examples are dioxins and furans, hexachlorobenzene (HCB), PCBs, or polycyclic aromatic hydrocarbons (PAHs).